“At its peak, usually within 24 hours of transformation from fluid to a solid, the cheese contains many billions of bacteria. In time, most of these bacteria succumb to the bleak, harshness of the anaerobic environment inside the cheese, but not without leaving behind a biological legacy of active cellular enzymes which produce low molecular weight compounds such as fatty acids, ketones, amino acids, amines and carbon dioxide. 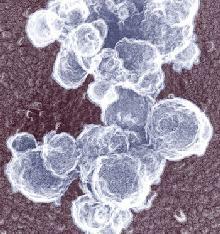 …Other bacteria exist in small numbers, initially, in the young cheese and then grow unexpectedly, triggered by curious symbiotic relationships. …Tracking bacteria in a ripening cheese is a complex operation. There may be certain species or strains in cheese which remain unknown simply because of a lack of proper culture media or technic. The enzymes prevailing in ripened cheese, omitting rennin and other added enzyme preparations if any, originate from the milk as natural tissue enzymes, seeping inadvertently with blood across the membrane barrier into the udder, or become freed from the millions of bacteria, yeast, or mold cells autolyzing in the cheese. Most familiar natural milk enzymes: protease, lipase, alkaline and acid phosphatase, catalase, and peroxidase. …Natural milk enzymes, peroxidase excluded, are heat labile, unable to withstand minimum pasteurization temperatures, and are not highly active at the pH range of young ripening cheeses, usually pH 4.6-5.5. In Camembert, Brie, or Blue, the pH rises with age to become mildly alkaline so in such advance cheese ripening natural milk enzymes may play an important role…it is difficult to confirm their contributions. The microbial cell enzymes differ in this respect…Endocellular enzymes appear in large concentration after the cells die and autolyze. 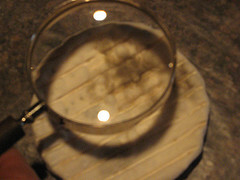 Also, some extracellular microbial enzymes probably contribute to important reactions involved in a ripening cheese, particularly those from mold or yeast….Most of these microbial enzymes are heat stable, and display high activity at the normal intial pH of a cheese…lipases, proteases, amino acid decarboxylases, and deaminases. Besides controlling the lactic acid fermentation, salt partially solubilizes monocalcium paracasein. Thus…salt helps give a smoothness and plasticity of body not fully attainable in its absence. 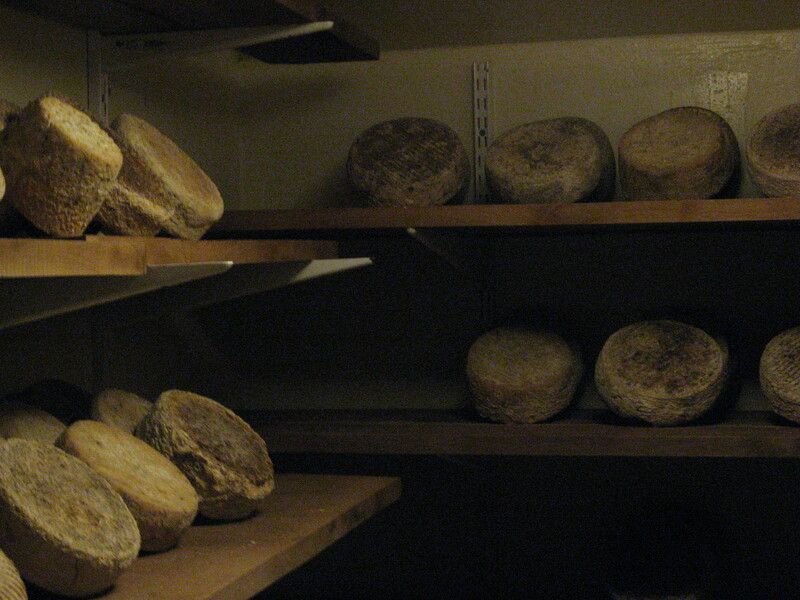 …Presently, the popular temperatures of commercial ripening range from 1 to 10 degrees C [for Cheddar]…The point is reemphasized that for any given cheese variety, the ripening conditions are characteristic for that cheese, dictated by composition, microbial load, and surface charcteristics; otherwise it would not attain consistent properties. Amino acids, fatty acids, methyl ketones of different carbon length, lactones, and many other organic compounds become free in the cheese and concentrate, dpeendent upon particular cheese types and the ripening conditons. Tyrosine…is highly insoluble and, in older cheeses, forms crystals. …In mold ripened cheese, normally carbon dioxide is given off heavily…but then later when the pH increases, ammonia is also generated.